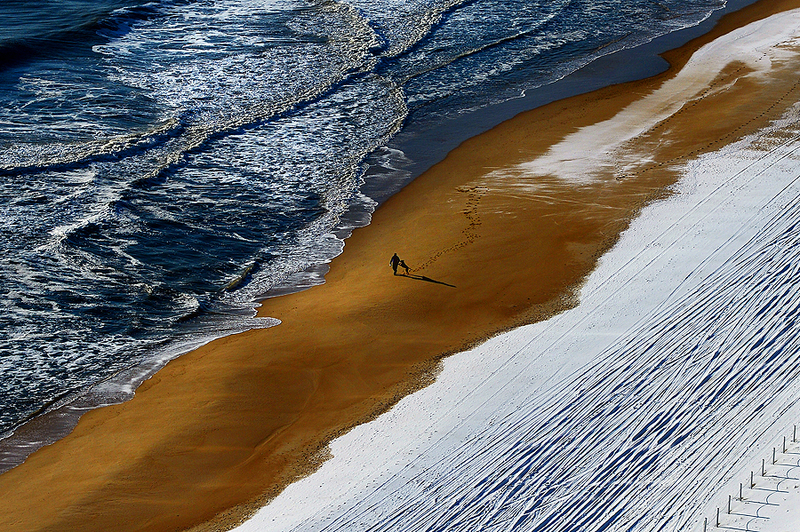 "After a light snow blanketed the surrounding area overnight, a passerby and their dog walk down the snow covered beach on February 17, 2013 in Ocean City, Maryland." This past weekend, I found myself in Ocean City, Md., for some business and pleasure. To my surprise, the forecast called for a dusting of snow. In all my years traveling to the eastern shore in Maryland, I've never seen snow on the beach. Late Saturday night, it began blowing, snowing and I realized that I may finally get to see the aforementioned once morning hit. I rose early before the sun and hit the beach to witness the magical scenery that is summer nostalgia meeting the reality of winter. Despite it being ice cold, it was worth getting out of bed for. I knew I probably wouldn't see this again for a long while, so I decided to find a high vantage point in a nearby condo. While much warmer inside, it took some patience waiting for a human element to enter the surreal painting like view. My waiting paid off, as this passerby walked toward me with their dog, and then a couple minutes later, a single person made their way south on the beach. By mid-morning, all the snow had melted, but these pictures serve as proof that it does happen. 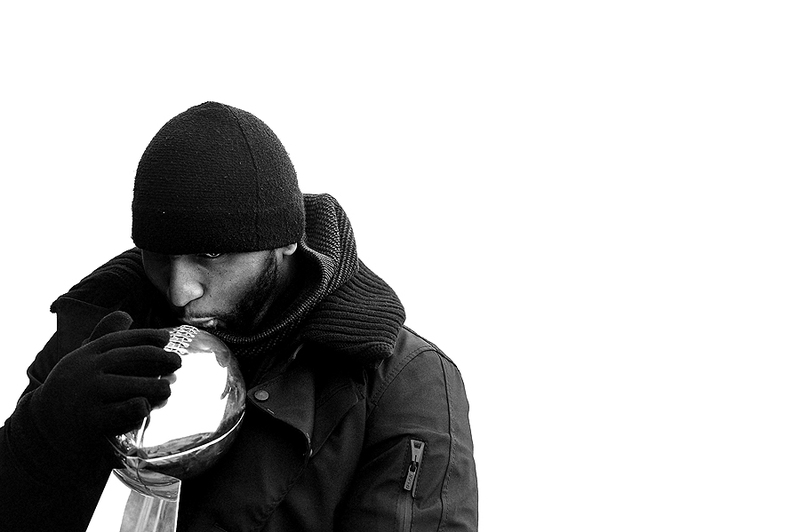 "Linebacker Ray Lewis #52 of the Baltimore Ravens kisses the Vince Lombardi Trophy as he and teammates celebrate during their Super Bowl XLVII victory parade near M&T Bank Stadium on February 5, 2013 in Baltimore, Maryland." 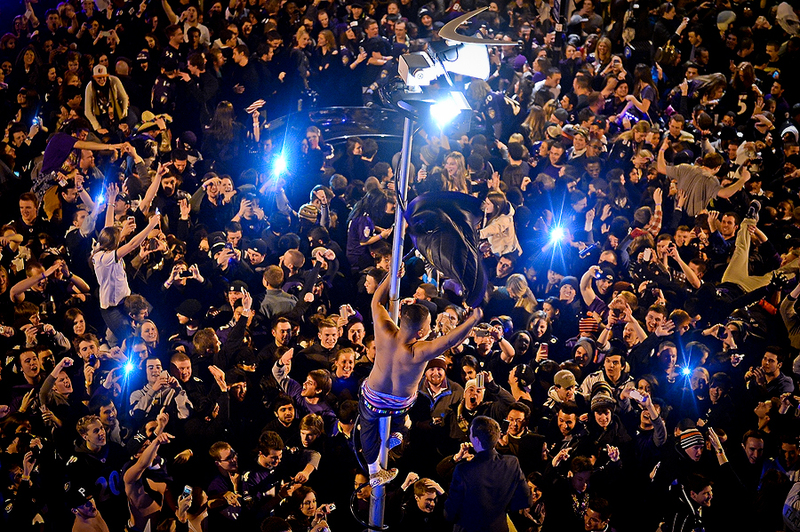 Two days following Super Bowl XLVII, I once again had the opportunity to document the city of Baltimore for Getty Images as the Baltimore Ravens celebrated their victory parade. Paired up with a friend and Getty teammate, we split what we thought the most important parts of the parade would be. It's always a risk going into unknown situations, but we ended up with a great take and planned the route perfectly. My role was to cover the parade downtown from and overpass and then do my best to get back to the stadium. I was fortunate to be able to sprint around the block away from the crowds to catch up to the caravan of players as they entered near the pair of stadiums. This very brief moment of quietness, in what was nothing short of chaos as 200,000-plus screaming fans chased the players around, ended up being my favorite moment of the day. As an athlete, I don't think there could be a greater feeling than knowing you've gone out on top before retiring - it was a good day for Ray Lewis and the Baltimore Ravens.